WAGmob brings you a Simple 'n Easy, on-the-go learning App for Learn Spanish Writing. 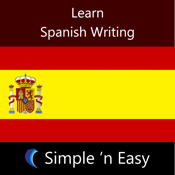 Learn Spanish Writing on your device. A fun way to pick up new language and practice it whenever you like to. Not just for pre-schoolers but adults too. In this app, you can practice Spanish letters along with numbers.Learn to write numbers and letters.This App helps you lot. App Tools include Facebook, YouTube integration and Refer to Friend feature. Our Vision: Provide simple 'n easy apps for a lifetime of on-the-go learning. Our Mission: A simple 'n easy WAGmob app in every hand.